I Worship Chaos feels like a true return to form for COB. Not that their last releases were bad, it just felt like they were trying too hard to be something that they weren’t. This album is their first as a 4 piece and I think that might have actually helped them. The band sounds very tight and in sync and they deliver one massive sounding record. Its heavy, its fast and its brutal! 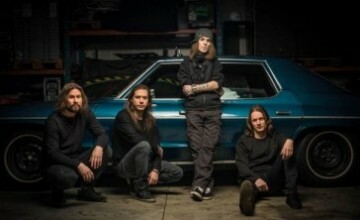 Welcome back Children of Bodom! Almost. I almost really like this album. I really want to, I hear good things about Bodom, but alas this is not for me. I like the instrumentation, I like the groovy guitar work, the booming bass, keyboards, drums – hell all of the musicianship; but then the singing starts. Is it a bad album? NO. I don’t want to scare anyone away – this is only an opinion piece and solely that of my own. If lyrics screamed into your inner ear are your thing – you will like this. Although I definitely don’t hate it, nor would I turn it off or “change the station” if it came on, I won’t likely put it on in the future. Charging into the pit, the beast smashes through the wall of death and freaks out when he hears ‘Suicide Bomber’. (Yes I am referring to myself in the third person.) 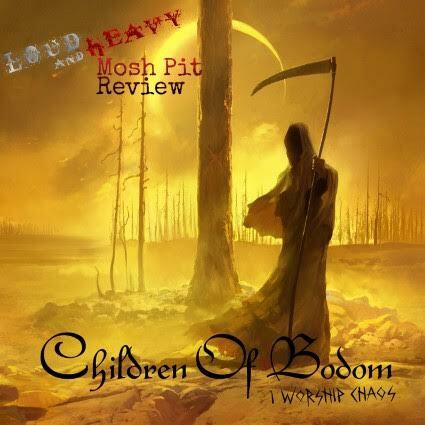 ‘I Worship Chaos” is the 9th studio album from the Finnish metal band ‘Children od Bodom”, and it kills. This album features the heavy sound, hard-hitting guitar riffs, audio punishment from the rhythm section, and powerful vocals we have loved for close to 20 years. Every track carries power, ‘Suicide Bomber’ and ‘I Hurt’, in my mind, are the best songs on this album. I know by the time this review is posted I would have listened to the album a dozen more times and probably have more songs to add to my list. That says a lot about a good metal album, being able to listen to it again and again, finding more to love with each play through. I had to look at this album from two different perspectives; the average listener and that of a longtime fan. While enjoying the creativeness of the four-piece sound, you won’t find any hit singles from this album. A lot of the tracks took a lot of replay ability for me to learn to enjoy them as being a follower of the band for so long. I didn’t find myself turning on my headphones and selectively coming back to this album, even while at the gym. For the average listener you might just skip right over this album and pick up something that intrigues you more, but for the hate crew it’s a moderate to average listen. I am in love with this album- it is packed with so many awesome riffs. I feel like they really got back in touch with their roots and with the sound they have been missing since the album Hate Crew Deathroll. However not only was this album extremely heavy and raw, but it also showcases many slower and unexpected yet appreciated tracks. I think the neoclassical aspect of Bodom has always been what’s resonated so much with me. This band has always carried its own edge so to speak, and I feel like that edge truly reemerged here in I Worship Chaos. I will admit the last couple albums (I feel) lacked the depth that I’m seeing in this album. The pure, raw, haunting sound that is Bodom has resurfaced itself with a force to be reckoned with. The quality of the sound is near perfection in clarity. My favorite track would be hands down “I Hurt,” to put it effectively this album is pure power enveloped in classical melodies.